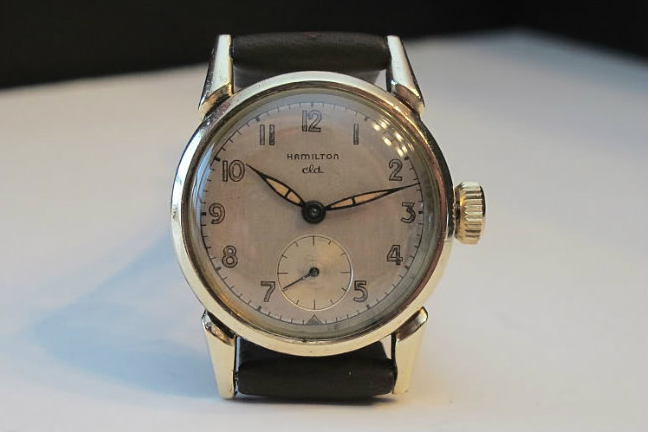 When Hamilton introduced the first CLD models in 1948, the Langdon was one of them. 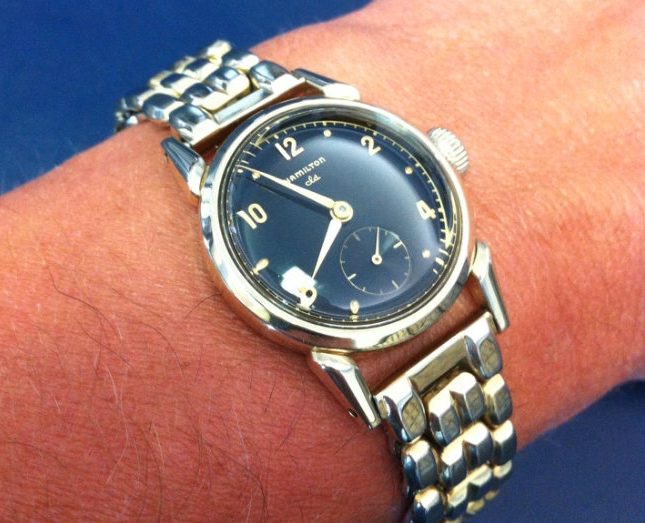 The next year Hamilton introduced an identical version in solid gold called the Lange. Other than the case material, all other details are the same between the two models. Both models were produced until the next generation of CLD models was introduced in 1953. 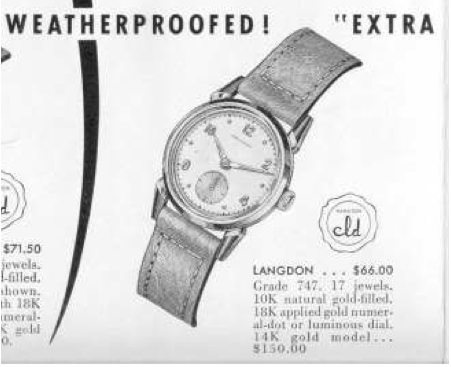 The Langdon came powered by the then new 8/0 sized 747 movement with 17 jewels. 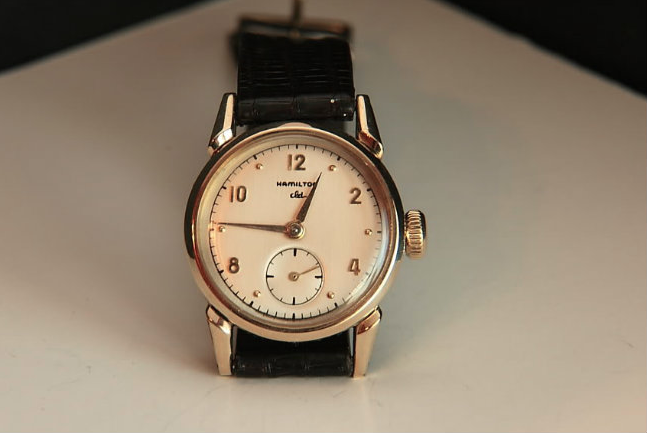 The 10K gold filled case also came with either an applied gold numeral and marker dial or a luminous dial with matching hands. All dials are sterling silver. Most Langdons wear the most on the domed crystal and sometimes the crown is worn almost smooth. The rest of the case seems to wear well and nice examples are easy to find. A new crystal and sometimes crown makes a world of difference. The case is a two piece design with a front bezel (with crystal) and a main case to hold the movement. The dial and movement come out through the front so the stem is a two-piece design with a male and female portion. As such, when the stem is pulled out to set the time the crown can feel a little wobbly if the gasket inside is worn (quite likely). It usually snugs back up when the crown is pushed back in to wind the watch. I happened to locate a very nice Langdon dial in black. It looks exceptionally good with none of the usual tells for being refinished. I don't know if there ever were black dialed Langdons but I think it definitely looks great in black. I wanted to compliment you both on your blog site and Etsy store; your knowledge and timepieces are very impressive and I visit both often. Take care. Hello Dan - do you have any step-by-step examples of getting into a cold case, replacing gaskets? Thanks as always for such a great site. Getting into the case is easy, just slip a pen-knife or case knife into the slit between the bezel and case back and pop the bezel off. The two piece stem can be aligned so you see the joint and the movement lifts out. Getting it back together is the reverse. New gaskets, if you can find them, are seemingly impossible to compress and close the case. It's rare that these watches still have working gaskets. So do you find that reassembly w/o gaskets leaves wobble in the movement/stem? No, but having the wrong crown will do that. The two piece stem for a CLD is a loose connection and prone to some wobble during setting. But if you have the wrong crown it can be worse. Most CLDs I've seen - and it's a lot - rarely have case gaskets. On your site I found the following part number as the replacement crystal for the Langdon: GS-PA318 (25.5mm). I'm hoping you will confirm that this is the correct part number. I'm also hoping you can tell me where I can buy a crystal gasket and a bezel gasket. I love your site! The information is invaluable.